Taking pride of place in the idyllic village of Farnham, the Museum Inn, and the self-catering Moles Cottage in the grounds behind it, cater specifically for game shooters. This is immediately evident upon entry, as Jake Eastham shooting photographs decorate the bar and restaurant. Farnham lies just north of the A354, which is the main Salisbury to Blandford Forum road, and therefore the hotel is rather well placed for such headline shoots as Ashcombe and Gurston Down to name but a couple. 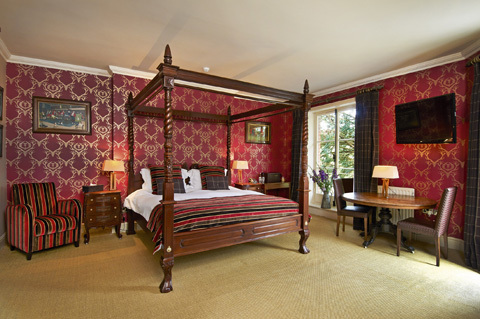 The General’s room is stunning, spacious and comfortable. The gun who manages to bag this room will definitely be the envy of their party. I’m sure it’s no coincidence there are eight rooms in the Museum Inn, just right for a shooting team. Four of these are in the main body of the pub and four are in the stables where dogs are more than welcome. And if you are lucky enough to secure The General’s room for the night then you are in for a treat. It’s a vast room with a four-poster bed and French doors out on to a balcony giving splendid views of a village that would definitely have had author Thomas Hardy purring. I think this is the sort of vantage point that my Scottish grandmother would have described as a ‘window in thrums’ after the J.M. Barrie novel of the same name. In short, it’s very handy if you are a nosy git, and like to watch the world going by, like me. The bar/restaurant area offers a good mix of locals enjoying a drink and diners tucking into tasty food in a smart but laid back environment. 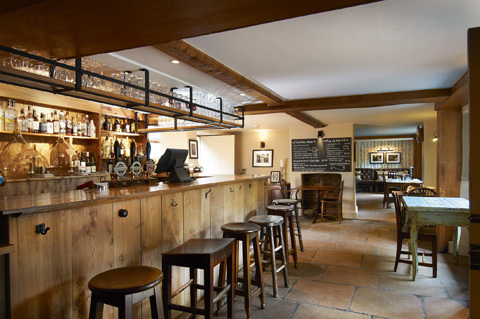 The bar/restaurant at the Museum Inn manages to deliver the atmosphere of a popular local pub and a calm restaurant in the same open plan space, with gamekeepers and other village residents all enjoying a pint. There is a separate large dining room for private functions as well as a very smartly appointed residents’ lounge where after dinner drams would easily disappear. The food is excellent, with Dorset snails and fillet of local venison making for a supper to cherish, and the service is top-drawer country pub style; informal but observant and friendly. Meanwhile, the eight-bedroom Moles Cottage sits behind a stone wall beyond the main hotel car park, and offers complete self-catering exclusivity for a team of guns if that’s what you are after. Dogs are welcome at the Museum Inn and there is also a gun cabinet in the cottage, so either way your shooting needs will be catered for in this very pretty part of Dorset. Location of the Museum Inn: Farnham, just north of the A354. Cost of a double room at the Museum Inn: From £110. Shoots close to the Museum Inn: Ashcombe, Crichel, Gurston Down.